I was introduced to the SDI (Self Directed Income) industry - formerly or otherwise referred to as either Network Marketing or Multi-Level Marketing in March of 1979. As for many people in the 1970’s my first exposure to the SDI industry was the “Amway” opportunity. As a preamble to this communication permit me to explain that there is an abundance of background information about the usuryfree community currency movement on the internet. 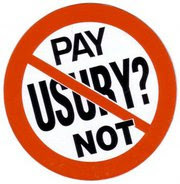 Simply go to any search engine and type any of these word combinations: “usuryfree community currency movement,” “usuryfree network,” “usuryfree day,” “usuryfree week,” “usuryfree living,” “life without usury,” etc. Information about the “usuryfree community currency” movement will be essential to fully comprehend the proposal that I am outlining herein. If possible, sometime after you have had an opportunity to read this letter and review the information presented I would like to arrange an online meeting (Skype or webinar) with yourself and anyone else you recommend to further discuss its contents. In the meantime, if you have not already done so, hopefully this letter will motivate you to pursue some, self-imposed research about the banking system in both Canada, and the United States (and elsewhere). Such research is essential to facilitate your understanding of why “usuryfree community currency” and/or “usuryfree corporate currency” - otherwise referred to as “usuryfree barter credits” are so very superior to the “electronic blips” which are commonly used to negotiate financial transactions both locally and globally - within our orthodox, economic system of debt money. In the mid-1990’s, myself and other SDI (Self Directed Income) entrepreneurs within my inter-connecting circles of influence made a decision to create new language for the marketing and distribution industry, of which SDI Generic is a part. As well, we recommended replacing the word “recruit” with the word “enrol” and we promote the radical concept of building an SDI Portfolio, i.e. earning more than one source of monthly income from SDI business opportunities. We also decided to replace the word “training” with the word “coaching” when we are showing the way to newly, enrolled SDI entrepreneurs. Since the mid-1980’s, I have been searching for an innovative and leading “home office” (company) in the SDI industry that will seriously consider and eventually initiate a “usuryfree corporate currency” as an integral component of its marketing infrastructure. If and when, SDI Generic, which supplies quality products to the consumer market, creates and implements an internal, “usuryfree corporate currency” as part of its marketing infrastructure, SDI Generic distributors, (SDI entrepreneurs) will enrol other free enterprisers with ease and these new enrollees will be motivated to remain as a part of the SDI Generic evolving, online community - rather than dropping out as has been the case with so many companies in the short history of the SDI industry. By creating an internal, “usuryfree corporate currency” and making your selected products available to SDI Generic entrepreneurs using a dual accounting system - one system for facilitating the trading of the “usuryfree corporate currency” and a parallel system for the trading of “electronic blips” as commonly used now in our orthodox, economic system of debt money. Each participating, SDI entrepreneur could expect remuneration (rewards or commissions) from the SDI Generic “home office” not only (a) in “electronic bleeps” otherwise known as “debt money” (which is often artificially in short supply) but also (b) in partial “usuryfree corporate currency” which can also be used to purchase goods and/or services (which are rarely in short supply) from other SDI Generic entrepreneurs listed on the database at the SDI Generic “home office.” All SDI Generic entrepreneurs with an account for trading a “usuryfree corporate currency” would have the marketing edge over other companies in the well-connected SDI industry and the non-connected, orthodox, retail stores. In any local community, the first SDI Generic entrepreneur with knowledge of the “usuryfree currency” technology would have the first opportunity to pitch all local, prospective, free enterprisers. Whole new markets will be opened up by the first SDI “home office” that adopts this usuryfree technology (software) and invites other free enterprisers to connect with them. To facilitate the process of adopting a “usuryfree corporate currency” as a necessary component of the SDI Generic marketing infrastructure, a concerted effort could be made to publish a special, online directory or catalogue. When new SDI entrepreneurs enrol with the SDI Generic business opportunity, they could be invited to list their “offers” and “requests” for any products and/or services they require for their ongoing, business, personal and family needs. This “usuryfree corporate currency” could be traded within our own loyal networks for consumable goods and/or services. First by using a portion of it to purchase SDI Generic products and/or services, and also by purchasing other consumable goods and/or services from within our loyal networks of SDI Generic entrepreneurs in our respective local or online communities. The SDI Generic “home office” could accept payment for products and/or services in partial “usuryfree corporate currency” (credits) and partial, conventional, “usury-bearing electronic blips” (credits) correctly defined as “debt money.” The optimal ratio of “usuryfree corporate currency” to “usury-bearing electronic blips” to yet be determined. Since the SDI Generic “home office” currently accepts “usury-bearing, federal currency in the form of “electronic blips,” why not create this alternate, economic system whose software can be easily programmed to exchange the “usuryfree corporate currency” (credits)? It is my conviction that this alternate and parallel, economic system of usuryfree finance will quickly become more popular than conventional, usury-based, debt money. The integrity of the “usuryfree corporate currency” is highly appreciated as there is absolutely, ZERO usury (interest) thieved by the banking cartel and the technology (software) is already in place to facilitate trading usuryfree credits on the internet. There are other attractive considerations to implement. Usuryfree creatives who double as SDI entrepreneurs support re-directing shopping habits away from the giant, trans-national, retail corporations to local businesses, of which home-based and SDI enterprises are a significant part. The SDI Generic “home office” is in a unique position whereby it could encourage its networks of SDI entrepreneurs to re-direct a portion of their consumable shopping habits away from the giant, trans-national, retail corporations to the ever-expanding and loyal, “shop local” market. The SDI industry is now a significant part of this loyal, “shop local” market. Yet another possibility and probability. The SDI Generic “home office” and the networks of SDI Genric entrepreneurs who agree to accept a percentage of commissions in the “usuryfree corporate currency” are invited to demand to pay an equivalent percentage of taxes (federal, provincial and/or state, and municipal) with their “usuryfree corporate currency.” This will not be a problem since any level of government can re-direct a portion of its regular spending (purchasing) to local entrepreneurs who will know how to negotiate and expand their respective, loyal, trading bases. Usuryfree creatives have already come up with a brilliant solution. “Usuryfree currency accounts” could be set up for the various levels of government, payments of taxes in the form of “usuryfree currency” could be deposited into these accounts by participating SDI entrepreneurs (and otherwise) in a ratio equivalent to their monthly earnings ratio of “usuryfree currency” and “usury-bearing debt money.” The bureaucrats could then be directed to spend this “usuryfree currency” for government purchases. The other significant detail to carefully consider is that any “usuryfree corporate software can be created to be fully capable of introducing self-insurance to any large database such as the ever-expanding database of SDI Generic entrepreneurs. This means that consumers will no longer have to pay insurance up front and hope they don’t have to make a claim. Instead, they will pay only after the accident or fire has occurred. When one member on the database has a car accident, a very small amount of “usuryfree corporate currency” will be deducted from each participating member’s “usuryfree corporate currency” account to pay for the accident, and no more will be deducted until the next accident. This innovative concept spells the end for insurance fraud and related abuses which are now so common in the insurance industry. Historically, the SDI industry has approximately a 90% attrition rate in any given 12 month period. For example, as of 1991, there were 10 million ex-Amway distributors worldwide. Consider that we are now twenty years advanced and add on the thousands of other SDI companies which have left multiple millions of ex-MLMer’s (SDI entrepreneurs) jaded and you begin to understand that the high rate of attrition must be addressed by any innovative, SDI “home office” that seeks to lead the way in the 21st Century, as the SDI industry gains widespread acceptance and respectability. Will the SDI Generic “home office” be the leading SDI company that will take action to halt the high rate of attrition so common in the industry by integrating creative trading (barter) as a worthy, community element to enhance its information, technology and distribution assets? Offering participating SDI Generic entrepreneurs dual trading accounts with connections to more than just products selected by the SDI Generic “home office” will surely solve the challenge of attrition not only for the SDI Generic business opportunity, but for the entire SDI industry. Having access to all of the additional “requested” and “offered” products and/or services listed in the ever-expanding, in house, database will definitely keep SDI Generic entrepreneurs active in the SDI Generic business opportunity and this in turn will foster ongoing growth for the entire SDI industry. Keep in mind that each SDI Generic entrepreneur quite likely has a family, and each person in that family has access to additional skills, products and/or services which can also be listed for trade on the interactive database. The larger the interactive database, the more attractive the concept of negotiating trades or exchanges becomes. Any SDI Generic entrepreneurs who agree to accept a portion of any sale in the “usuryfree corporate currency” will be giving a distinct, co-operative advantage to their respective networking community who eventually will be able to offer to accept ever more “usuryfree corporate currency” and consequently, there will be less demand for the conventional, usury-based, debt money to negotiate mutually, beneficial transactions. Any SDI company, such as the SDI Generic “home office” could easily pay a portion of “usuryfree corporate currency” to (a) employees or contractors as wages and to (b) SDI Generic entrepreneurs as commissions. Anyone who accepts “usuryfree corporate currency” will be invited to spend it with other participating, SDI entrepreneurs listed on the internal database. Obviously, this database will have the potential to grow and expand as the concept of usuryfree living shifts from a dream to a reality. When free enterprise thinkers in local communities learn that SDI Generic entrepreneurs have an abundance of “usuryfree corporate currency” as well as sufficient “usury-bearing debt money” to spend, they will become motivated to enrol with the SDI Generic business opportunity to be in the envied position of having direct access to the tried and proven, usuryfree technology. It is anticipated that as we progress into this 21st Century, “usuryfree corporate and/or personal currencies,” otherwise referred to as “barter credits or IOU’s” will become extremely popular simply because they are correctly defined as “usuryfree” credits. SDI Generic entrepreneurs are invited to accept Canadian Tire money (or its equivalent in other countries) for small change when negotiating transactions as the small denominations of Canadian Tire money are already a valued currency. Sir/Madame, if you would like further consultation on this unique and powerful concept, you are invited to review the content at the suggested websites. (see below) Be sure to follow any noteworthy links to relevant information. Your self-imposed research will help you fully understand the overall power of negotiating trades or exchanges with any “usuryfree corporate or personal currency” being used in the SDI industry. Hopefully, you will be motivated to fully comprehend the uniqueness of this timely and perfected model of a usuryfree banking system. This background information will permit you to better understand how the SDI Generic “home office,” a potential leader for the next stage of development for the SDI industry can maximize its growth by making “barter” an integral component of its SDI infrastructure. Should you be interested in communicating with one of the engineers who are responsible for the creation and development of the original, “usuryfree,” LETS (Local Employment Trading System) software, to optimally understand the global mission of creating a usuryfree lifestyle for everyone on planet earth, I can arrange contact at your request. In any case, I await feedback on this communication. If you are interested in integrating the “usuryfree corporate currency” technology within the marketing infrastructure of the SDI Generic “home office,” and thereby introducing it to the SDI industry and advancing the reality of usuryfree living to complement your other worthy goals the LET’S commence our work. If you are not interested in exploring how to integrate the “usuryfree corporate currency” technology within the marketing infrastructure of the SDI Generic “home office”, please advise me as soon as possible, so that I may direct my energy and resources to the corporate teams of other leading and innovative “home offices” (companies) in the SDI industry.